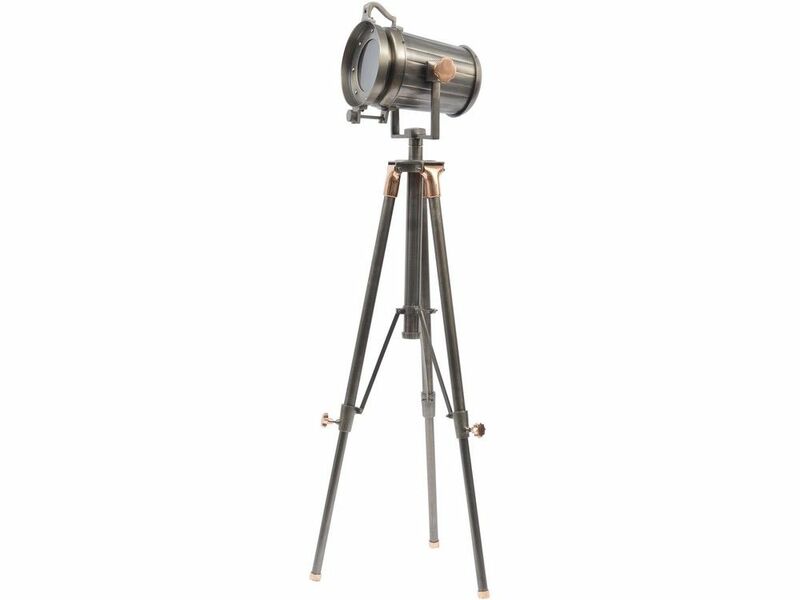 This tripod spotlight floor lamp takes an iconic design and gives it a contemporary twist, with its copper embellishments against a modern satin grey finish. The searchlight-style lamp head can be positioned for mood lighting or to enhance a room feature with its array of hinges, brackets, rivets, slides and thumbwheels, all adding to the vintage authenticity. The mix of warm copper against smoky grey give this metal telescopic legged tripod lamp a character feel, and creates floor lighting that would make a statement in any space. This metal spotlight floor lamp is a versatile item that works with both modern and classic decor; it oozes contemporary cool fused with a touch of old-fashioned glamour.